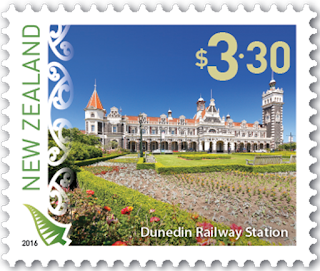 Virtual New Zealand Stamps: Dunedin Railway Station. A collection of stamps featuring this iconic building. 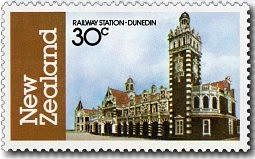 After parliament buildings and the beehive, Dunedin Railway Station must be one of the buildings most featured on stamps. This beautiful building with its attractive light and dark stonework looks nothing like a station from one side and was once one of the busiest stations from the other. It was built at a time when Dunedin was booming with wealth from gold rushes of inland Otago. Now it is quieter, the station only seeing a few tourist trains each day and the building turned to other uses. But it is still the iconic building, the tourist attraction it always was. And it still makes a great subject for a stamp too. 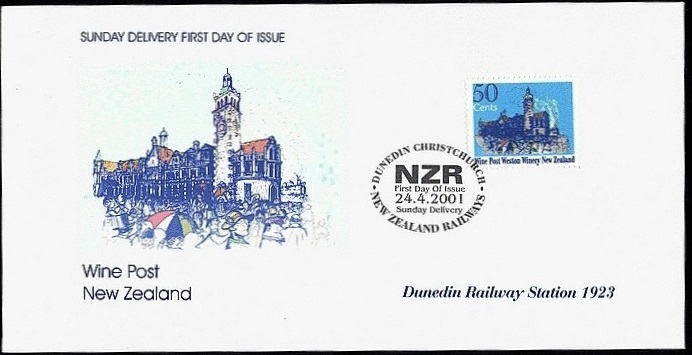 For stamps on other railway subjects see Trains of New Zealand. 1982 Architecture - 30c Dunedin Railway Station. Dunedin Railway Station is a fine example of Flemish Renaissance Revival architecture. The foundation stone was laid by the Minister of Railways Joseph Ward on 3 June 1904. The Prime Minister Richard Seddon was also present. The station was opened by Ward, by then Prime Minister, in 1906. Construction was kept within budget and cost £40,000. The station is constructed of dark basalt from Kokonga in the Strath-Taieri with lighter Oamaru stone facings, giving it the distinctive light and dark pattern common to many of the grander buildings of Dunedin and Christchurch. A not to be missed attraction is the booking hall which features a mosaic floor of almost 750,000 Minton tiles. At its peak, it was the busiest station in New Zealand with over 100 passenger train arrivals each day. Today with passenger activity dwindling to a couple of tourist operations, the station building has been put to other uses. It is still an important icon for the city. 1984 Cover - Dunedin Railway Station. 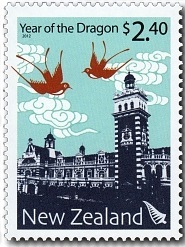 A view of Dunedin Station on a illustrated cover. The famous clock tower and the main entrance from the street are seen in this photo. 2001 New Zealand Wine Post - 50c Dunedin Railway Station. New Zealand Wine Post - Page Two 2000 - 2009. 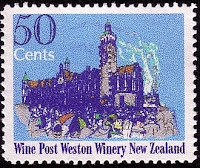 In 2001, local post, New Zealand Wine Post issued a stamp showing the Dunedin Railway Station since they are based in Dunedin. This stamp appears to show the produce market that is held every Saturday morning, in front of the station building in ANZAC Square. 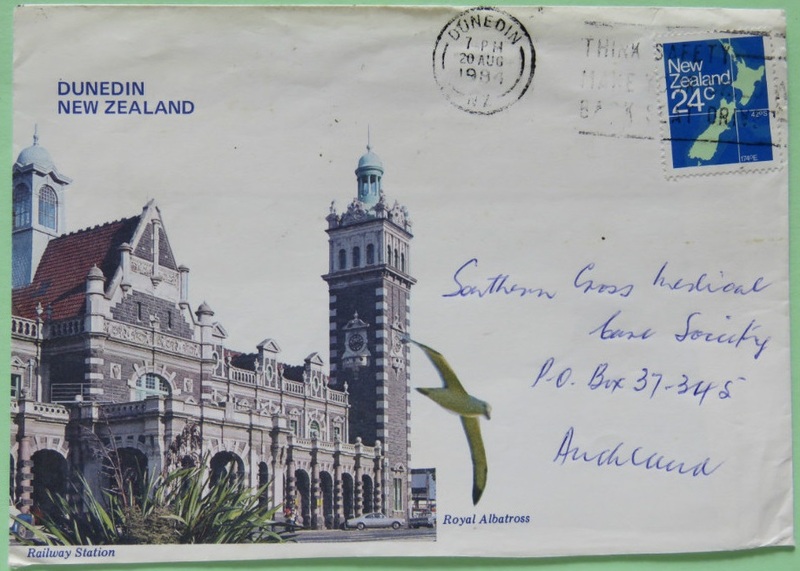 It does not show clear detail like of many of my other Dunedin Station stamps which gives the building an almost church-like appearance. The image printed on the cover looks better. Sorry, Mary, I don't like it. 2002 Architectural Heritage - $1.50 Dunedin Railway Station. $1.50 - Railway Station, Dunedin. New Zealand has a long heritage of some amazing buildings with the Dunedin Railway Station being one of them. The buildings is a fine example of the building style very common with Christchurch and Dunedin during the time it was built. 2012 Chinese New Year - $2.40 Dunedin Railway Station. 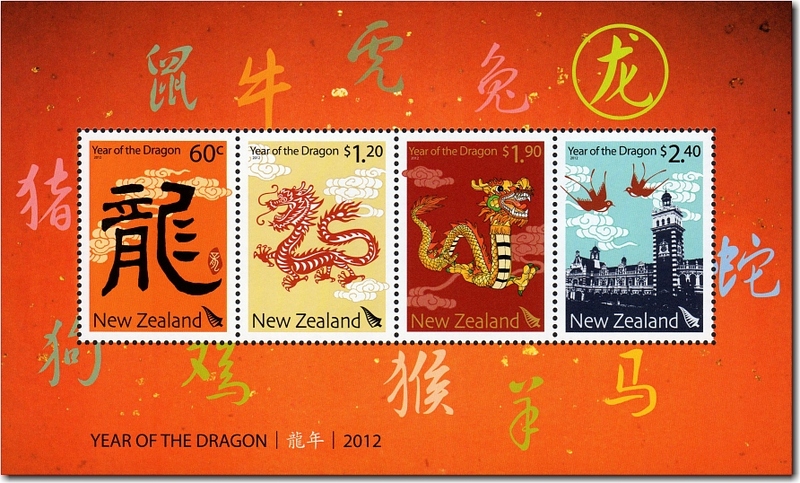 Part of the second series of Chinese New Year issues was to use a New Zealand icon in the highest value. The Dunedin Railway Station certainly fits well here. Of course, other features of this stamp such as the Chinese-style clouds clearly connect it to Chinese New Year. 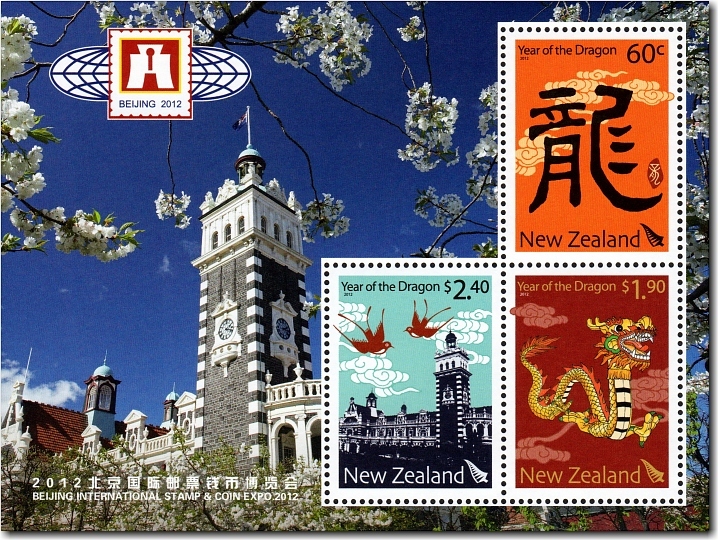 The 2012 Chinese New Year Miniature Sheet showing Dunedin Railway Station in the top value. This special Miniature sheet was prepared for the 2012 Beijing International Stamp & Coin Expo and features the station as a background against 3 of the Chinese New Year stamps. I think that the picture shown on this sheet shows the beauty of the building, the detailed stonework. 2016 Scenic Definitives - $3.30 Dunedin Railway Station. Designed by Sir George Troup, this visually striking building was opened in 1906 and is designed in the Flemish Renaissance style. Troup was nicknamed ‘Gingerbread George’ for the eclectic and unusual architectural style of the station. At the height of the station’s popularity, it was handling up to 100 trains per day. This view is the only one I have ever seen from this angle showing the full length of this building. Normally photographers tend to focus on the tower to the far right as can bee seen in all the stamps above. Notice the gardens of ANZAC square that appear in the foreground of some of these stamps.